Ariel Agemian’s works range from poignant portraits, capturing the true essence of a person, to beautiful nudes and lively paintings of daily life and beauty, and inspired religious works. You can view many of these by following the gallery links at right. 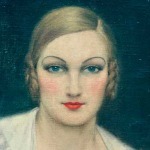 Many of his portraits were of prominent figures during the 1930s and 1940s. For example, the artist was honored to paint Pope Pius the XI, Cardinal Agagianian, and Gionvanni Martinelli, the French Minister, Louis Martin as well as the wife of the actor Akim Tamiroff. His stunning and provocative nudes, as reflected in the painting entitled Artificial Paradise and Nareide, were occasionally banned from public viewing. Some were eliminated from a showing at the YMCA in 1947. The model for many of his nudes was the French Countess de Vernou de Bonneuil. Ariel visited the Shroud of Turin in Turino many times in the late 1920s. 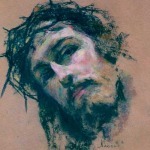 These visits inspired him to paint the Face of Christ in 1935. 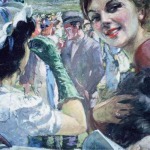 He spontaneously painted those people who came into his life, as models for the present project, or because he wanted to capture their spirit on canvas. These paintings included Armenian women and men, who were considered part of his extended family. He enjoyed capturing Annig’s school friends in the project he was doing at the time.